Many chief business officers (CBOs) in higher education are concerned about the financial stability of their institution in the near future. While more than half (56%) "strongly agree" or "agree" that they are confident their institution will be financially stable over the next five years, 44% are neutral or disagree. Public sector CBOs are somewhat more positive about the next five years than their private sector counterparts -- 60% versus 51% strongly agree or agree. Less than half of private baccalaureate CBOs are optimistic about their institution's fiscal stability in the near future (49%). The financial outlook in the long term is more uncertain for business officers, though. Fewer than half -- 48% -- agree or strongly agree that their institution will be financially stable over the next 10 years, and more CBOs are neutral about their institution's stability in the long term than they are in the near future (33% vs. 28%). Private sector CBOs are just as confident about their institution's financial stability in the next 10 years as they are about the next five years. I am confident my institution will be financially stable over the next five years. I am confident my institution will be financially stable over the next 10 years. The concern that many higher education business chiefs have about their institution's financial stability is underscored by their perception that the higher education sector is in financial crisis. More than seven in 10 CBO's say media reports suggesting that higher education is in the midst of a financial crisis accurately reflect the general financial landscape of higher education in this country. The 71% holding this view is up from 63% a year ago and 56% in 2015. These findings are from Inside Higher Ed's 2017 Survey of College and University Business Officers booklet, which provides insights into how CBOs perceive and address financial matters at U.S. higher education institutions. Gallup conducted the survey via web on behalf of Inside Higher Ed May 2-June 10, 2017. Potential Bubble in Higher Ed? 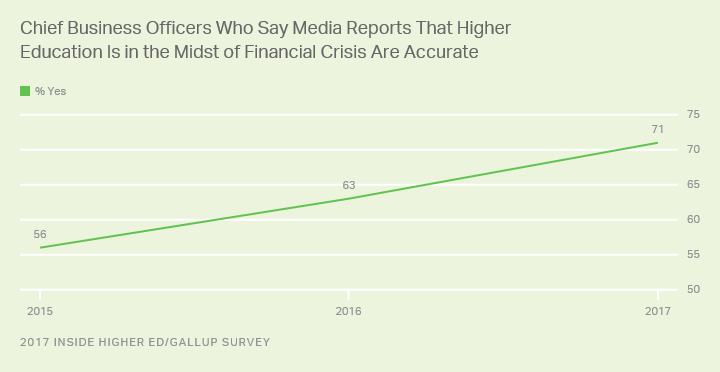 Financial leaders from public (68%) and private (74%) institutions are about equally likely to say media reports of a crisis in higher education are accurate. Of five sectors studied, leaders from private baccalaureate (79%) institutions are most likely to say that reports of a financial crisis are accurate. This may reflect the particular vulnerability that some of these institutions faced during and in the wake of the recession. CBOs from public doctoral institutions are least likely to say the financial landscape is dire, though a majority still say so. In your opinion, do media reports suggesting that higher education is in the midst of a financial crisis accurately reflect the general financial landscape of higher education in this country or not? The financial instability of higher education is consistent with concerns that the sector faces a potential bubble -- namely, inflated prices relative to demand. As Gallup Senior Economist Jonathan Rothwell points out in a recently released report, higher education has seen rapid price growth without any measurable increase in quality since 1980. As a result, higher education has claimed a growing proportion of the nation's spending over the past three-plus decades, contributing to the slowdown in U.S. productivity growth over the same period. With enrollment at higher education institutions projected to decline in the coming years, it is clear to CBOs that higher education's financial challenges are real and persistent. These financial challenges require collaborative, creative, multifaceted approaches to boost the quality of postsecondary education, while simultaneously curbing costs. Gallup conducted the survey via web on behalf of Inside Higher Ed May 2-June 10, 2017. The survey is an attempted census of all chief business and financial officers at U.S. higher education institutions and included the most comprehensive sample information available. Gallup sent invitations via email to 2,801 chief business officers, receiving 409 responses. Respondents represented 217 public institutions, 184 private institutions and eight institutions from the for-profit sector. Bible colleges and seminaries and institutions with fewer than 500 students enrolled were excluded. Gallup statistically weighted data to correct for nonresponse, matching the obtained sample to targets for all U.S. colleges and universities. The weighted sample results can be considered representative of the views of chief business officers at colleges nationwide. Learn more about how the 2017 Inside Higher Ed Chief Business Officers Survey was conducted. 83% of U.S. adults with some college education find work-based sources of advice about their major helpful, but only 20% use them. The Ritz-Carlton is a model for colleges and universities -- but not in the way you think. There's a coming data revolution in higher education, but it's not the "big data" revolution that many have been hyping. This revolution will be about the voices of consumers and constituents in higher education.